It’s possible to perform a file upload by typing a valid file path into an HTML5 file input form field. Set up your files in the File Upload preferences page (under Window > Preferences > Web Performance > File Upload). All of the files you create here will be uploaded to your load engines in a special directory that exists for that purpose. Inside your testcase, create a “Type Text” action against the HTML file input field. The action must not clear the contents of the field before typing. 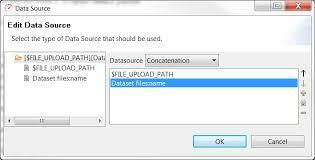 Edit the data source in this action so that it is a concatenation of the “File path” data source and the name of the file. The file path data source points to the special file upload directory.